To understand the cellular and circuit mechanisms of experience-dependent plasticity, neurons and their synapses need to be studied in the intact brain over extended periods of time. Two-photon excitation laser scanning microscopy (2PLSM), together with expression of fluorescent proteins, enables high-resolution imaging of neuronal structure in vivo. In this protocol we describe a chronic cranial window to obtain optical access to the mouse cerebral cortex for long-term imaging. A small bone flap is replaced with a coverglass, which is permanently sealed in place with dental acrylic, providing a clear imaging window with a large field of view (~0.8–12 mm2). The surgical procedure can be completed within ~1 h. The preparation allows imaging over time periods of months with arbitrary imaging intervals. 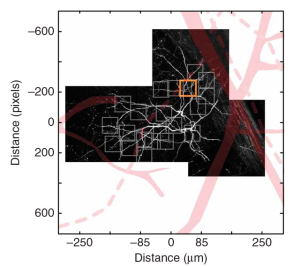 The large size of the imaging window facilitates imaging of ongoing structural plasticity of small neuronal structures in mice, with low densities of labeled neurons. The entire dendritic and axonal arbor of individual neurons can be reconstructed.